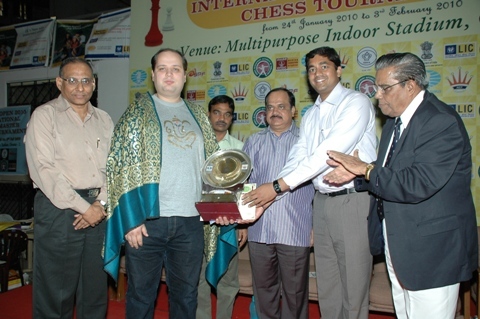 Maxim Turov of Russia won the Chennai Open 2010 international chess tournament sponsored by LIC & ONGC and organized by Sports Promotion Foundation, today, collecting 9.5 points from 11 rounds and conceding only three draws. His title fetched him a cash prize of two lakh rupees. GM Ziaur Rahman of Bangladesh, R. Siddharth of Tamil Nadu and national junior champion M.R. Lalith Babu of Andhra Pradesh, tied for the second to fourth places scoring 9 points each. They were placed in that order based on the Buchholz tiebreak. Maxim had a formal seventeen move draw against Ziaur and Lalith Babu could not make any headway in his game against the fellow IM Richard Bitoon of Philippines and settled for a draw. R. Siddharth extended his good show, carving out a nice win over Asian Junior champion Ashwin Jayaram, also of Tamil Nadu. He mopped up Ashwin’s king side pawns completely and Ashwin resigned when his queen was trapped by Siddharth’s aggressive rook. After winning a knight for two pawns, Pavel Kotsur of Kazakhstan tried in vain to win against Vikramaditya Kamble of Railways. Kamble stoutly defended the position and agreed for a draw in a king vs and king and pawn position. Six times national woman champion S. Vijayalakshmi of Indian Airlines found her rhythm against former under 25 national champion B.T. Muralikrishnan of Railways. By splitting the point with GM Alexander Zubarev of Ukriane, Anwesh Upadhyaya of Oriss lost his chances to obtain the GM norm, in addition to the IM norm already earned. Combining his queen and knight beautifully, GM Sundaarajan Kidambi checkmated former national champion P. Konguvel. Shri. Y. Pradeep, Secretary, RMK Residential School was the chief guest for the prize distribution function. Shri. R. Ganesan, Chairman of the organizing committee presided, Mr. Nagesh, Regional Manager, LIC of India was the Guest of Honour. Shri A. Surya Narayana Rao, Correspondent, Jawahar Vidyalaya and Shri. J.C.D. Prabhakar, Vice President, TN State Chess Association offered felicitations.